Lehman Catholic’s Grace Brandt reaches for the ball as Jackson Center’s Riley Jackson loses momentum on her slide towards third during a nonconference game on Saturday in Sidney. Jackson was tagged out on the play. 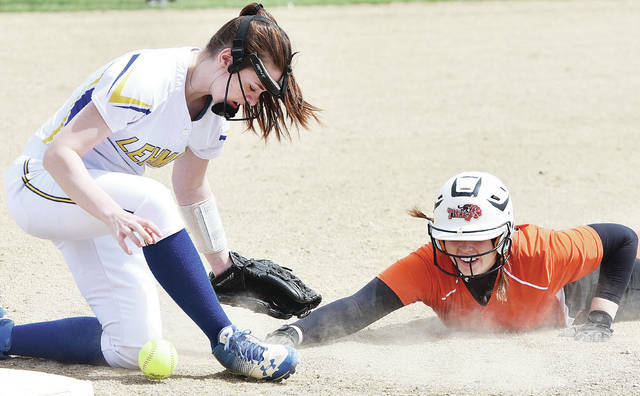 Lehman Catholic’s Angela Brunner fields a ground ball as Jackson Center’s Kenleigh Fortner runs for third during a nonconference game on Saturday in Sidney. SIDNEY — Lehman Catholic scored five runs in the fifth inning to break a tie and earn a 13-8 victory in a nonconference game on Saturday in Sidney. Jackson Center scored three runs in each the first and second innings to take a 6-3 lead. The Cavaliers scored five in the third to take an 8-7 lead, but the Tigers scored one in the fourth to tie it. 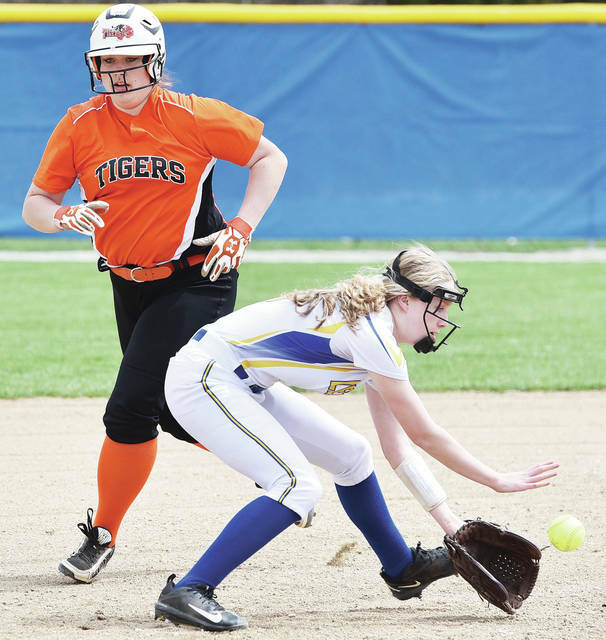 Lehman had nine hits and five errors while Jackson Center had nine hits and three errors. Lehman’s Annie Stiver and Madalyn Kirtley pitched in the victory. Stiver had seven strikeouts and two walks and Kirtley had two strikeouts and one walk. Meghan Chamberlin, Kirtley and Grace Monnin each had two hits. Chamberlin had a double. The Raiders earned a nonconference victory on Saturday in Russia. They had 15 hits and four errors while Ansonia had eight hits and four errors. Olivia Moorman was 5 for 5 at the plate. She had 4 RBIs and scored four runs. Jenna Cordonnier, Riley Hammonds, Shea Borchers and Kendall Monnin each had two hits apiece. Hammonds had 2 RBIs and a double. Borchers and Ashley Scott also each had a double. Morgan Wenrick earned the win in the circle. She pitched four innings and allowed one earned run on four hits and three walks. She had one strikeout. The Wildcats won the first game of a nonconference doubleheader on Saturday in Minster in five innings. They had nine hits and no errors while the Redskins had two hits and three errors. Jenna Poeppelman earned the win for Minster. She pitched a complete game and had nine strikeouts. Taylor Homan was 3 for 3 with 4 RBIs and three runs for Minster while Kaitlyn Wolf was 2 for 3 with two runs. Each of Homan’s three hits were home runs; Karly Richard also hit a home run. Wolf and Poeppelman each hit a double. Lauren Bergman was charged with the loss for Fort Loramie. She allowed seven earned runs on six hits in three innings with two strikeouts. The Wildcats took the lead with three runs in the second inning and held on from there to win the second game of a doubleheader on Saturday in Minster. They had nine hits and no errors while Fort Loramie had 11 hits and one error. Jenna Poeppelman earned the win. She pitched a complete game and allowed three earned runs. She had five strikeouts. Poeppelman and Emily Stubbs were 2 for 3 at the plate. Stubbs scored two runs and hit a double. Laney Hemmelgarn and Lindsey Albers both also hit doubles. Aleah Frilling was charged with the loss. She pitched a complete game and gave up four earned runs. She had three walks and three strikeouts. Clara Gephart was 3 for 4 while Katelyn DeLoye was 2 for 3 for Fort Loramie. Aubrey Baker hit a home run and Gephart, Frilling and Ellie Holthaus each hit doubles. The Jets lost in five innings in the first game of a home doubleheader on Saturday. Ridgemont had nine hits and no errors while Fairlawn had four hits and three errors. Allison Roush was charged with the loss. She gave up five earned runs on eight hits and four walks in four innings. She had one strikeout. Skylar Jones hit a triple and Ashley Roush hit a double. The Jets lost in five innings in the second game of a home doubleheader on Saturday. Ridgemont had 16 hits and no errors while Fairlawn had six hits and one error. Skylar Jones was charged with the loss. She pitched a complete game and had three strikeouts and seven walks. Lauren Dudgeon, Renee Gent, Katie McKenzie, Madison Pierce and Ashely Roush each had a double for Fairlawn. The Wildcats won their first nonconference game of the season by beating Miami East in the first game of a doubleheader on Saturday in Casstown. Peyton New had three hits and 4 RBIs for Houston. Marah Sanders and Addie White each had two hits. Emilee Foster earned the win in the circle. She pitched a complete game and allowed three earned runs. The Wildcats lost the second game of the doubleheader on Saturday in Casstown in five innings. Allisen Foster had two hits (including a double) and Reese Rosenbeck had two hits and 2 RBIs. Rylie Voisard and Emilee Foster each had two hits. The Cardinals scored three runs in each of the seventh and eighth innings to rally and earn an extra-innings victory in the first game of a doubleheader on Saturday in Lima. They had 10 hits and one error while Central Catholic had 12 hits and two errors. Molly Smith was 4 for 5 with 2 RBIs for New Bremen while Hannah Tenkman was 2 for 4. Maddi Lozier hit a home run while Kelly Naylor, Tenkman and Abbi Thieman each hit doubles. Smith earned the win in the circle. She pitched two innings and didn’t allow a run. She had one strikeout and gave up three hits. The Cardinals scored four runs in the second inning and led the rest of the way in a victory in the second game of a doubleheader on Saturday in Lima. New Bremen had 12 hits and three errors while Central Catholic had nine hits and four errors. Kelly Naylor was 3 for 4 for New Bremen with 2 RBIs and had two runs. Taylor Paul, Kira Bertke and Erin Smith each had two hits. Maddi Lozier, Kelly Naylor and Abbi Thieman each hit one home run while Bertke and Marissa Topp each hit a double. Taylor Paul hit two doubles. Molly Smith earned the win in the circle. She pitched a complete game and allowed seven earned runs. She had six strikeouts and gave up five walks. The Pirates gave up 10 runs in the first three innings and couldn’t mount a comeback in the first game of a doubleheader on Saturday in De Graff. Newton had 11 hits and three errors while Riverside had six hits and six errors. Shelby Giles was charged with the loss. She pitched a complete game and gave up two earned runs. She had two strikeouts. Kalin Kreglow was 2 for 4 with 1 RBI for Riverside. Shelby Giles and Jalynn Stanley each hit home runs. Newton scored four runs in the second inning and led the rest of the way in the second game of a doubleheader on Saturday in De Graff. Riverside had seven hits and five errors while Newton had 12 hits and no errors. Jalynn Stanley was charged with the loss. She pitched a complete game and allowed seven earned runs. She had four strikeouts and four walks. Stanley was 2 for 3 at the plate with 2 RBIs and Sierra Snow was 2 for 3. Stanley and Shelby Giles each hit one double. The Trojans split a home doubleheader against Lima Perry on Saturday. Perry won one game 15-7 and Botkins won the other 9-7. No statistics or other information was reported.